Dungeon is an Australian based traditional / power metal band, and One Step Beyond is their fourth album. My first exposure to the band was their pervious album, A Rise to Power. That was a solid, yet unspectacular album that seemed to get lost in the shuffle shortly after I wrote the review of that album. It's safe to say that the band has improved with their latest offering, although not enough to move themselves into the first tier of bands playing this genre. Dungeon is playing melodic metal, in the traditional mold. There are some power metal and even thrash influences to be heard. However, as the name of the band seems to imply, the core of the sound is of the underground, chains and leather heavy metal. 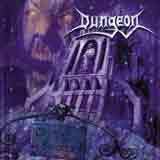 With this release, Dungeon has introduced some twin guitar leads which give the album a distinct Iron Maiden flavor. In addition to that, Lord Tim's vocal delivery is similar to Bruce Dickinson, at least stylistically. He doesn't have even close to the range of Dickinson (not many do), but he uses his voice effectively. Oddly, I find that a mix of Jeff Keith (Tesla) and Bruce Dickinson may be the best way to describe Lord Tim's voice. The riffs gallop along, almost taking on a thrashy sound at times throughout the album. In general, I would say that Dungeon have introduced a harder edge to their sound since the last album. The riffs pound a lot harder, the duel guitar leads add another dimension to the songs, which was a bit lacking the last time around. Despite this, the band has maintained a nice sense of melody. The hooks and harmony vocals fit nicely into the mix, with the first two Steel Attack albums coming to mind quite often. I found that the song structures on this album to be very strong. Excluding the instrumental track, the album contains only 2 songs under 5 minutes, with the rest ranging from 5-8 minutes in length. There are enough catchy refrains and melodic lines to maintain the listener's interest throughout the album. In addition, the musical selections are fairly technical, yet well played. I still believe that Dungeon need to add a personal touch to their music. While the songs structures and individual performances are excellent, I am still left with a sterile feeling once the album has concluded. A lot of this I attribute to the rhythm section, which sounds very generic and almost robotic. The typical power metal double bass pedal dominates the album, and there is little to no imagination coming from behind the kit. Sure, you won't hear any mistakes, and the drums do provide a steady and heavy backbone to the sound, but this aspect of the sound gets very repetitive and thus very predictable fairly quick. In addition, I think Lord Tim is still developing as a lead vocalist. He sounds so much better on this album technically, but still sounds reserved behind the mic. Also, I really think he has more range that what he displays here. If he were to just let it all out occasionally, I think he would pull it off quite well. The last I heard, Lord Tim will be handling vocal duties for fellow Aussie metal band, Ilium on their forthcoming album. I look forward to hearing how Lord Tim sounds on that album. With the sheer number of bands in this genre, it is crucial to have a personal touch to your music. Without that, a band is destined to fall into the anonymous realm of "cookie cutter" bands. Dungeon has the musical talent as far as musicianship and songwriting to take them far, but I feel that they need to inject a personal touch into their music that separates them from the masses. The increasing confidence of Lord Tim behind the mic and some adventurous drum selections would go a long way toward achieving that, in my humble opinion.